Terrarium TV is an android app, recently preferred by most over other services like Kodi due to it’s reliability and ease of use. However the only disadvantage with Terrarium TV is that it’s an android application, also known as an APK. This means it’s compatible on all android devices including Tablets, TV’s and Mobile Phones, but not compatible straight away on other operating systems such as Windows and iOS. In this guide, we’re going to show you how you can get Terrarium TV working on a Windows device. Like other guides, this does require Bluestacks. There is no Windows app available currently, and there is no work around. First off, we need to download & install the BlueStacks player. BlueStacks is the most popular Android Emulator, allowing you to run Android applications and games from your Windows System. If you’re into a lot of mobile games, you will also now be able to play them on your PC/Laptop. Run the downloaded file and go through the installer. Ensure you follow all the steps required, including logging in if necessary. The installation process should be simple and fast. Once it’s installed and open, ensure that you’re under the ‘My Apps’ tab, it should look like the image below. Note the red arrow pointing to ‘Install APK’ at the bottom, we’ll need this in a minute. For the next step, you will need to download the latest Terrarium TV APK. At the time of writing this post, the current version was 1.9.2. The file downloaded will be an APK File, and most likely be in the Downloads folder. 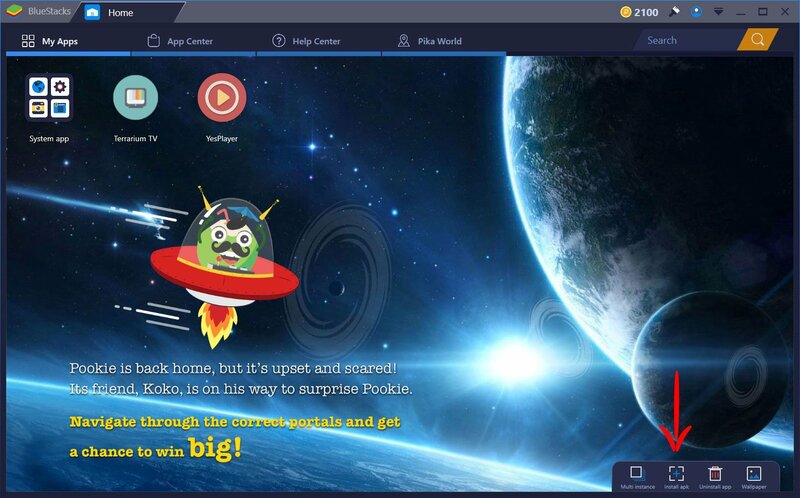 Go back into the BlueStacks application, and press the ‘Install APK’ button located in the bottom right side of the screen. Browse to the directory where the APK File is located that you downloaded and select it. Pretty much instantly, the new Terrarium TV Application should show up on your Home Screen under the ‘My apps’ section. Congratulations, you now have Terrarium TV installed on your PC or Laptop running Windows! Each time you want to open Terrarium TV, you will have to do so through BlueStacks. You can use your mouse and keyboard to navigate the application and menus, and use the icons in the bottom right of BlueStacks to make it full screen.